I am a multiple project type of gal. I like having multiple projects to work on. But sometimes I get carried away and the projects multiply faster than I can work on them. And that can be overwhelming. That’s when the project boxes come in handy. I can put some of the projects neatly away for a bit. They are all ready for when the mood strikes, but they are not laying around making me feel guilty for the way I choose to work. So I went out and went through my stash, and had great fun cutting out hunks of all my favorite fabrics, and then carefully cutting them into 6 inch squares. I have enough to make each block a different fabric! As I cut the squares, I had great fun re-visiting old and new favorite fabrics. It occurred to me that this is a great idea for a memory quilt. So many memories are attached to my fabric–where I was when I bought it, who I was with, and sometimes even the quilts that I have made with the fabric. I got out the ten little pieces that I intended for the “Characteristics of God” series. I am making them into sandwiches and embroidering the words on them. And in the evenings, this one seems to have taken preeminence, because it is so enjoyable to stitch on with that DMC Coton Floche thread. I choose one block to work on, and then choose the threads that I want to use. It usually takes an evening to stitch one block. I love sharing my work with others. What I don’t love is paying $30-40 and having someone say “no thank you” with no explanation whatsoever. I don’t have a solution to this problem. But I think for $30-40, a short explanation of rejection should be included. Yes, I’ve heard all the explanations of why a piece might be rejected. I know that the more you enter your work, the higher the chance that it will eventually be accepted. But $30-40 is a lot of money. Children are dying of hunger and thirst every day, and I do mean this literally. It is something that concerns me. And selfishly spending $30-40 in the hopes that an unnamed stranger might like my work and accept it into their show is not something that I enjoy doing on a regular basis. Here’s an interesting story about that. Last fall I entered a rug into the big rug hooking contest, Celebrations. One of my instructors felt that it had a very good chance of being accepted. A few weeks ago I realized that I had never heard from them pro or con. So I started investigating. And the question I asked was, “I would like to know if my rug was viewed.” Lo and behold, my $35 entry fee went through just fine. But the rug images never made it to the judges. Now, in all fairness, I have to give kudos to the woman I was corresponding with. She could have just brushed my concern aside. But she was honest, investigated what had happened, and was very apologetic about the whole situation. Anyway, all that leaves me with still wanting to share my work with others. Recently, I showed a couple of the pieces in the “what they said” series to my pastor’s wife to see if there would be any interest in sharing them at my church. She was most enthusiastic, and I ended up displaying them for Easter weekend. I really loved sharing them with others. If anyone has a church that would like to have a display of any of my quilts, I would love to share them. After sharing them with my church, Grace Fellowship, in Jackson for a few weeks, they will go to Oak Hills Church in Folsom, and will be there from May 14 through June 18. If any of you are in the area, there will be an artist’s reception on Friday, May 19, from 7pm to 8:30pm. I’d love to see you! I am finally starting the “what they said” series. I had chosen about 20 phrases that people uttered when they encountered Jesus. The different reactions people had were quite outstanding, and I don’t think I have ever seen them addressed. So I feel very firmly that this is something I am meant to do. But the HOW was not exactly established. I knew I wanted them to be somewhat simple, so that the words would take the pre-eminent place in the work. As the time approached, I got out all the little squares that I had pieced at my Lake Tahoe retreat (that retreat turned out to be a VERY GOOD THING!) and decided that I would use them in this series. I thought a LOT about whether or not I wanted the quilts to be the same size. I usually don’t work that way. Then I saw how Melody Johnson mounts her small works on a cradled wood panel, and I thought that might be another way to add interest to this series. 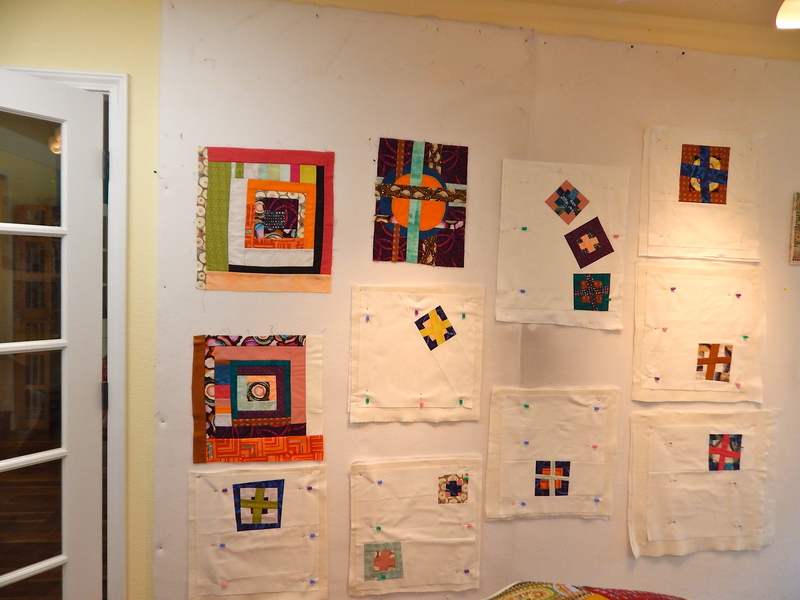 I haven’t decided for sure whether I will mount these quilts like that, but it helped me to make the decision to make them all the same size, and to choose a size that will fit on wood panels that are available. Almost all of them will be 15″ X 15″. One of the reasons that I continued making sandwiches was because I knew how to piece these simple tops. But, as usual, I got a little stuck at the quilting. I finally followed my BF’s advice, and did a little quilt-sketching. That broke the barrier. 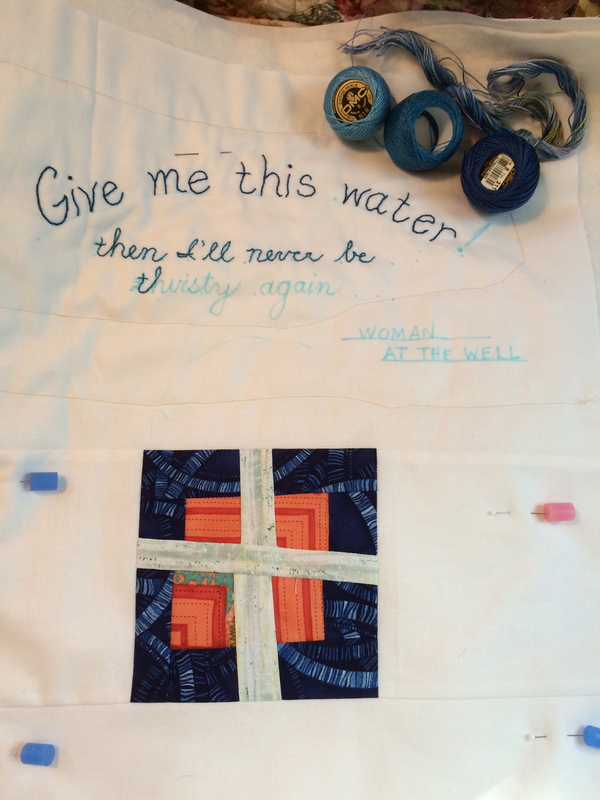 Yesterday, I sat down and put the words on the first quilt with my blue pen and started embroidering. I have my starting sketch all ready to go so I can quilt it as soon as I finish the words.